Friesz, Brennan, Partridge, Byrne (Fahey 62), Gavin, O'Brien (Harris 75), O Cearuill, Haverty, S Fitzpatrick (Guy 66), G Fitzpatrick Bialek. Rogers, Connelly, A Keane, Lester, Fitzgerald, McCulloch, Faherty, Foley (Davoren 81), Russell (Glynn 87), J Keane, Murphy. Galway United boosted their chances of avoiding the drop to the First Division with a deserved win over St Patrick's Athletic at Richmond Park. 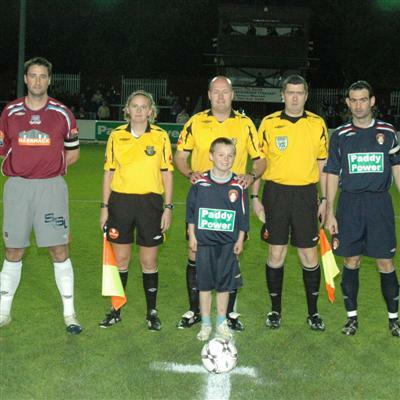 The in-form Vinny Faherty netted the winner for The Tribesmen on 22 minutes against a below-par home side. Galway now move level on points with Cobh Ramblers but have a much better goal difference. With European football secured for next season - and one eye on Friday's big Dublin-derby FAI Cup semi-final with Bohemians - Pat's fielded a mostly second string side. Lance Friesz was chosen ahead of Barry Ryan in goal while there was a rare start for Pole Jaro Bialek. With the exception of the absent Jay O'Shea, who will play with the Republic of Ireland U23 side tomorrow, Galway were at their strongest and in control from the start. Friesz was in the thick of the action early on and made a string of decent saves as Galway piled on the pressure. The first came on 10 minutes from a Ciaran Foley shot after Jason Gavin had failed to control the ball. The US net minder then denied John Lester on 15 minutes and Alan Murphy a minute later. Murphy played his part when Galway took the lead on 22 minutes. It was his knock-down that Faherty connected with before heading past Friesz from close range. The Galway dominance continued as the half progressed with their goalkeeper Gary Rogers having little to worry about at his end. It was 13 minutes into the second half before Rogers had to make a save. That was from a blistering Dessie Byrne free-kick from 25 yards out. Just four minutes later Byrne limped out with what looked like a hamstring problem to be replaced by Keith Fahey. Ryan Guy then replaced youngster Stephen Fitzpatrick and the St Pat's side was becoming to look that little bit stronger and more experienced though they still found it hard to create decent chances. Later still, Jamie Harris came off the bench and went up front, a position he has been used in recently. John Russell could have made it two for United on 78 but couldn't get a touch to an inviting ball from the right while Fahey shot into the side netting for Pat's in the first of four minutes of injury time.